November is National Diabetes Month, and today is World Diabetes Day. The purpose of focusing on diabetes is to create awareness among people who have the condition, as well as among health-care professionals, organizations, and communities. Being “aware” of diabetes also means focusing on ways to help prevent it in the first place. I recently attended a diabetes prevention summit in Massachusetts. One of the speakers shared a slide that was a picture of an iceberg. The tip of the iceberg represented the 29 million people who have diabetes (certainly, a staggering amount). And the iceberg submerged below the surface represented the 86 million people who have prediabetes — an undeniably grim and astonishing figure, to be sure. But there’s a silver lining here: Prediabetes can be halted in its tracks. It takes effort, certainly, but it can be done. First things first: Prediabetes, by definition, is a condition in which blood sugar or HbA1c levels are higher than normal, but not high enough for a diagnosis of diabetes. It’s that grayish area between having blood sugars in a safe and healthy range and blood sugars that are too high, which, as we know can lead to certain complications, such as heart disease and nerve damage, for example. • Being overweight — having a body-mass index higher than 25 and, especially, carrying much of your weight around your middle. • Family history — diabetes runs in families. • Race/ethnicity — the risk of diabetes is higher in African Americans, Asian Americans, Hispanic Americans, Native Americans, and Pacific Islanders. • Age — your risk goes up the older you get. • Gestational diabetes — having diabetes during pregnancy raises your risk. • Other health issues — high blood pressure, high triglycerides (a type of blood fat), and low HDL (“good”) cholesterol are also associated with an increased risk. A fasting blood glucose test: You can’t eat anything for at least eight hours leading up to the test. A blood glucose reading between 100 mg/dl and 125 mg/dl indicates prediabetes. An oral glucose tolerance test: Again, you can’t eat anything for at least eight hours before. Your blood glucose will be checked, and then you drink a sugary drink; two hours later, your blood glucose is checked again. If that reading is between 140 mg/dl and 199 mg/dl, you likely have prediabetes. An HbA1c test: You don’t need to fast for this test. 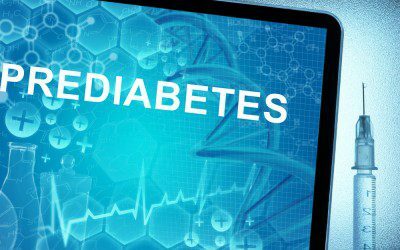 An HbA1c from 5.7% to 6.4% indicates prediabetes. Any of these tests may be repeated to confirm a diagnosis. You have prediabetes — now what? Finding out that you have prediabetes can be frightening, and you may feel helpless or hopeless. But it can be useful to view a prediabetes diagnosis as an opportunity. Studies show that prediabetes can be stopped from turning into Type 2 diabetes. In fact, “lifestyle interventions,” such as losing some weight, eating healthfully, and staying active, can lower your risk of getting diabetes by almost 60%. That’s pretty amazing, if you think about it. But how do you do all of this? Get a move on. Yeah, yeah, you’re thinking. But really, activity is a key factor in diabetes prevention. You don’t need to start running marathons or join a gym. What you should strive for, though, is getting 150 minutes of moderate physical activity every week. It sounds like a lot, but you can break it down into, say, 30 minutes of activity, five days a week. And you don’t have to do it all at once — try doing 10 minutes of activity, three times a day. Speaking of “moderate,” use the “talk test” to gauge if you’re being active at a moderate intensity. If you can talk while you’re exercising but you can’t sing, you’re right on track. Lose a little weight. Here’s where people get discouraged because they’re thinking, “I have 50 pounds to lose and I’ll never do it.” The reality, though, is that losing between 5% and 10% of your body weight can help do the trick. If you weigh 200 pounds, losing 5% to 10% of your weight would mean losing 10 to 20 pounds. Losing weight isn’t easy, but aiming to lose a small amount can seem more doable. Eat better. You don’t need to starve yourself or follow an unrealistic diet. Instead, cutting back on portions, using a smaller plate, eating more vegetables, and drinking more water can get you going. Working with a dietitian can be helpful so that you can craft an eating plan that works for you. Track, track, and track. Start tracking your food intake, your physical activity, and your weight. Slashing your diabetes risk by 60% includes staying on top of everything, and the best way to do this is to keep a record of what you’re doing. You can use good old-fashioned pen and paper to track. You might also create a spreadsheet or use a smartphone app. What’s most important is that you make tracking a part of your prevention routine. Join a program. Changing habits isn’t easy, and you might benefit from a little support. Look for Diabetes Prevention Programs in your community. These programs bring together people who have prediabetes or who are at risk for Type 2 diabetes for a period of one year. Each session, you’ll talk about a different topic, and you can share your experiences, while getting tips and support from your group leader and everyone else in the group, too. While most of these programs are in-person, some are online, which might better work with your schedule. To find a diabetes prevention program near you, visit the CDC’s website. While she will always worry that one of her children will be diagnosed with Type 1 diabetes, Amy Mercer no longer lets it overwhelm her. Bookmark DiabetesSelfManagement.com and tune in tomorrow to read more.